Hi James, I saw you tweet about this and went to check them out. Two hours later I have wasted a lot of time trying to sign up as well as on their live chat trying to get them to explain exactly what they offer and why it is better than my current shared multi-account hosting. Really not impressed! They couldn’t tell me anything about whether it would be better or faster than my current multi-account hosting with Ventra (that costs around 1/4 the price), other than that the support would be better. I am sure it will be better performance, I just want to know how much better and see some stats on the hardware. The chat person gave me a link to sign up and test out their cloud dashboard (I still have no idea what that is), which would be free until I “spun up a server”. But each time I went to the link or added it to cart manually I was taken to a blank page. I switched from Firefox to Chrome and got a little way there, but then the page went blank after I entered all my details! My noobiness about hosting stuff aside, their inability to explain what they offer and having several parts of their basic sign up process actually broken in several browsers is kind of off-putting. Do you use their service and how do you find it? Rackspace’s Cloud products (cloud servers, cloud files, cloud database, etc) are different to a typical web hosting product such as a shared cPanel hosting account that VentraIP offer. 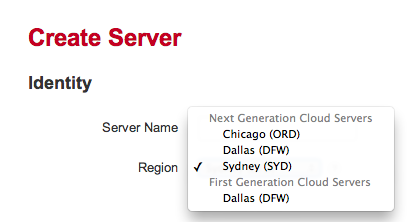 Rackspace’s Cloud Servers product is basically your own VPS in the cloud. If you’re after a managed web hosting offering (such as shared or reseller hosting), then Rackspace probably isn’t what you’re looking for. However if you’d like to manage your own operating system and hosting stack (ie a VPS), then Rackspace’s cloud servers could be of interest to you. Thanks James, yeah they ended up phoning me to complete the order and we got it sorted. Then when I logged in to try it all out I was unable to create a server because the options for Linux/Windows were not being shown (and the interface would only load in Chrome, not Firefox or IE). I created a block storage unit to see if that would help and then it wouldn’t let me delete it because it said there was a dependent snapshot that had to be deleted first, but it wouldn’t let me delete that either! I guess they’re having teething problems with the new deployment but this is kind of a ridiculous number of obstacles/errors to encounter. I submitted a ticket to their “fanatical support” and it took almost a full day to get a response … with Ventra I usually get a response within 20 minutes. Then the support advice was basically directing me to their documentation about how to create and delete servers and snapshots. This was all self explanatory and intuitive – the problem is that the interface isn’t working – a point they seem to have ignored. I’ve now sent them snapshots with each stage of the errors. All the while I’m being charged for the server space that it won’t let me delete! Anyway, sorry for the rant, but I just have never seen such a poor level of service/performance … and I’ve dealt with some BAD hosting companies. Just wanted to warn people they might be better off waiting til they iron out the problems with their local deployment. That doesn’t sound good at all Damien. Thanks for the heads up!